My husband recently went away with our two older boys, my brother and a great family friend to the Grand Canyon in Flagstaff, Arizona for a bit of a male bonding getaway. They decided to drive, I guess to enhance the bonding experience. They hiked a total of 12 miles in one day and the stories they brought back are priceless. My daughter and I stayed back with the baby and I have to say it felt a little like a mini vacation at home. Now don’t get me wrong, I really love my guys at home, they add a special spirit to the home, but it did feel good to have my own say without much interference for a few days. We had frozen yogurt at 10:30 pm one night, falafel for dinner another night with some girl friends, woke up on a Sunday had a nice breakfast, zipped to the chicken feed store and enjoyed browsing the farmers market here in town all without a complaint or grunt from anyone. Bliss. My daughter and I decided to make their favorite Pakistani rice dish, Chicken Biriyani, for their arrival because after four days of eating outside food I knew they would be craving our traditional home food. Since I did miss them I also decided to make my caramel cheesecake that my husband loves and I have not made for a very long time. I found this recipe 21 years ago, 21 YEARS AGO?? Wow time is flying!! Ok, I am better now, as I was saying, I found the recipe in Bon Appetit Magazine when I was engaged to my husband and it was the first cake I made for him, even before I had attended culinary school. This was my first masterpiece and probably The cake that helped me decide to become a chef. So see, I did miss my guys. I brought out the heavy hitters for a Grand Welcome Home. Over the years I have played around a little with this recipe, the major adjustment was the addition of the all purpose flour to the cream cheese mixture. I found that it just gave the cake a better body and I also changed the cooking technique by starting the cake 500˚F for 10 minutes and finishing the cooking at 200˚F. It gives the cake a nice golden crust outside and a rich creamy center that holds up well when sliced. It is also a much quicker way to bake a cheesecake then the traditional water bath method, though you do have to wait a bit to dive into this cake because allowing it to sit overnight in the refrigerator is a must to achieve the right texture. You will need a 10″ spring form pan. Preheat the oven to 400˚F. Pre-heat the oven to 400˚F. Have a 10-inch round spring form pan and a baking sheet ready. Mix the graham cracker crumbs and the sugar in a bowl to combine. Add the melted butter and mix until the mixture resembles wet sand. Place the mixture into the spring form pan and press on bottom and up sides firmly until the crust is compact and even all around. Leave a half-inch border of crust running along the sides of the pan. Bake for about 10 minutes or until light golden brown. Set aside to cool. Pre-heat the oven to 500˚F. In a 4-quart Kitchen Aid Mixer or a large bowl and a hand held mixer, beat the cream cheese until light and fluffy. Next in a small bowl combine the sugar and flour and whisk until incorporated. Now add the sugar mixture to the cream cheese and mix on medium speed for 20 seconds, stop mixing, with a rubber spatula, scrape the bowl around the edges and on the bottom to loosen the cream cheese. Now add the eggs 2 at a time, stopping after each addition, scrapping both the sides and the bottom of the bowl to make sure that the cream cheese is not sticking and making lumps. Next add the vanilla extract and lemon juice and mix for a few seconds. On low speed add the cream in a slow stream, once added increase the speed to medium and finish mixing to incorporate, another 20 seconds. Keeping the spring form pan on the baking sheet, pour the cream cheese mixture in to the crust pan. Now tap the pan firmly on a strong surface to help alleviate any air bubbles in the cheesecake. Place in the ovens middle rack and bake at 500˚F for 10 minutes, or until light golden brown on top, then lower the oven temperature and bake for another 35-40 minutes. The cake should be a darker golden brown color, slightly wiggly but firm in the center, and the edges should puff a bit. Once you have achieved this, take out of the oven, cool to room temperature and then refrigerator overnight uncovered if possible. In a heavy saucepan combine the sugar and water, gently stir until the sugar is fully mixed with the water. On medium high heat cook until the sugar melts, cover the pan for 2 minutes with a lid to help the sugar from crystallizing around the edges, uncover and cook until you achieve a caramel light brown color. Now carefully add the heavy cream a little at a time so as to not boil the mixture over. Once you have added all of the cream and the mixture slows down, and is not boiling so aggressively add the vanilla extract and the butter. Slowly stir until the butter has melted and incorporated fully. Finish the sauce with a pinch of salt and stir to combine. Store the sauce in a heatproof bowl. The caramel sauce can be stored covered in the refrigerator for up to a week. Have all of your components ready and set out on your countertop. Take the cheesecake still on the baking sheet and with your spatula, run it around the edges of the cheesecake carefully. Now unclip the spring form pan clip and gently start to open it and separate the pan from the cake. Remove the ring and set aside. Have your cake circle and or platter near by and with the spatula, slip it between the bottom of the pan and the cake, and run the spatula all around the bottom of the cake until you feel that it is completely released. Carefully slide it onto the cake circle and or platter. 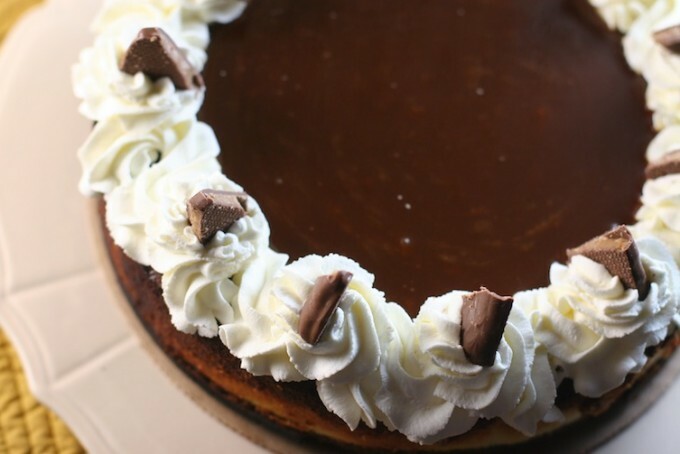 Now take your caramel sauce and pour half into the center of the cake and let it spread to the edge of the cheesecake. You may use a clean spatula to help it spread a bit as the caramel sauce does get a bit thick once it is cool. Next take your filled pastry bag and make S shapes around the edge of the cake, turning the platter as you go. With the remaining whip cream make 8 rosettes evenly spaced on top of your S shapes and finally garnish each rosette with a triangle of your candy piece. 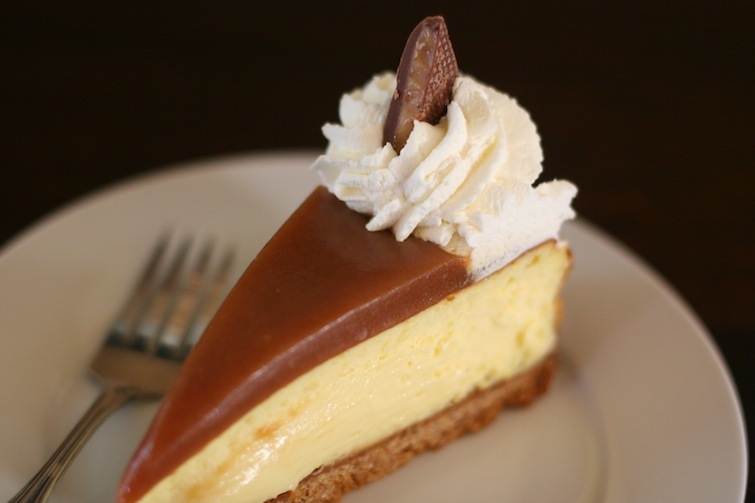 Serve the finished cheesecake with the remaining caramel sauce on the side to spoon on top if you wish.